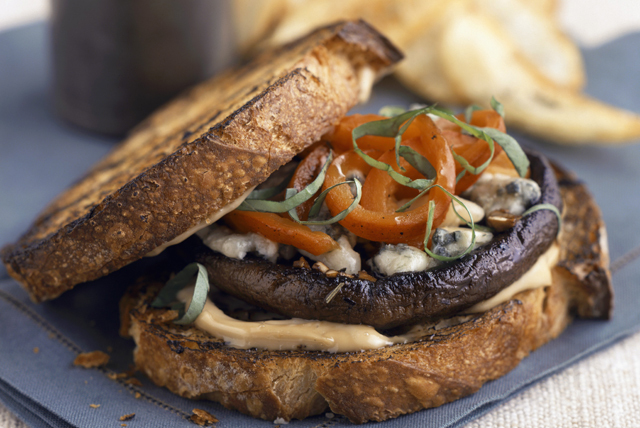 Try our inventive and delectable vegetarian grilled sandwich recipe. Made with portobello mushrooms, fresh basil, roasted red peppers, blue cheese and toasted multi-grain bread flavoured with our robust sun-dried tomato dressing, this vegetarian recipe is a must-try! Brush mushrooms with 2 Tbsp. dressing. Grill 3 to 4 min. on each side or until tender. Remove from barbecue. Add bread to barbecue; grill 1 min. on each side or until lightly toasted on both sides. Mix Miracle Whip with remaining dressing; spread onto 4 toast slices. Top with mushrooms, cheese, peppers and basil. Cover with remaining toast slices. Substitute fresh parsley for the basil. For added flavour, finely chop 1/2 garlic clove; mix with Miracle Whip mixture before spreading onto toast slices.